At the top, under the advertising banner, is the menu bar that changes for each page of the site. To activate the desired section, click on it. On the top left, the small flags represent the languages supported on CarpCup and enable you to change the current language. Below the link "Go to on-line carp enduros" is the compulsory area where you will access the on-line carp enduros once you have confirmed your registration. The menu at the bottom of the page gives access to the rules, to various practical areas of functionality, and also enables you to contact us. 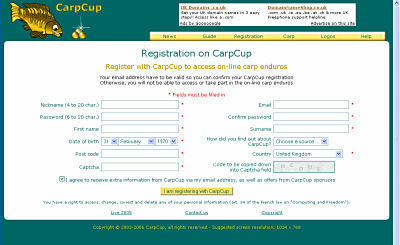 Now that you are more familiar with the home page, were are going to start our standard tour with CarpCup registration. 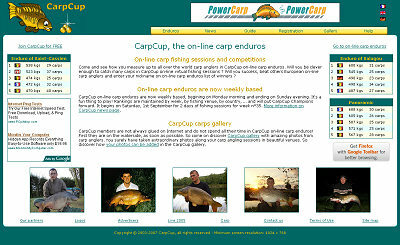 Registration on CarpCup is free and compulsory to access the on-line carp enduros. Be careful to fill in the various fields required correctly. Indeed, as indicated in CarpCup rules, giving wrong information may lead pure and simply to the cancellation of your registration. Read the instructions given on the registration page carefully in order to fill in the various fields correctly. And don't forget to read the information at the bottom of the page before submitting your registration with the button "I am registering with CarpCup". As soon as you make your request for registration, CarpCup processes it. If it is valid, a page confirming your registration is displayed, like the one shown to the left of the screen. If not, CarpCup redisplays the registration form indicating where the error occurs. You should then correct it and re-submit your request. Once your request for registration has been accepted, CarpCup sends you the email "Your registration on CarpCup". Open it and follow the instructions given in order to confirm your registration on CarpCup. If you do not confirm your registration request, you can not access the on-line carp enduros. Once this confirmation has been done, you may go back to CarpCup and return to the home page to access the on-line carp enduros.